Introducing the new Performance Series IP kits from Honeywell. The kits feature 1080p IR-illuminated, IP66-rated cameras, and an embedded NVR with a user-friendly set-up and configuration wizard that takes you to live video in minutes. 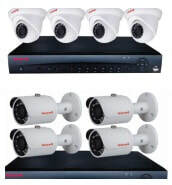 You have a choice of a 1 or 2 TB embedded NVR (up to 8TB storage optional) and 4 IP ball cameras OR 4 IP bullet cameras. These bundled kits offer the perfect economical and flexible solution for small to medium sized businesses. View up to four channels simultaneously on your monitor. All channels live view and play back at 1080p @ full frame rate. Bidirectional audio communication for the NVR. IR LEDs facilitate recording in dimly lit or nighttime scenes. Waterproof (IP66) camera housings are perfect for outdoor installations. Camera configurations to improve image quality and reduce image size, and to detect and respond to alarm events. The Quick wizard and PoE support of plug-and-play makes setup fast and easy. Physical installation within minutes with the help of comprehensive and easy-to-understand quick installation guides for the NVR and IP cameras. Store videos and snapshots to external storage, such as the client’s PC, through the Internet. Monitor from anywhere using the mobile apps for Apple and Android smartphones, tablet computers, and laptops. Configurable motion detection and camera tamper detection settings,including configurable alarm alerts, such as automatic emails (with attached video or snapshot) and automatic alerts (such as buzzers or flashing lights). Remote configuration and firmware updating through Honeywell Viewer web client and the Honeywell Config tool. Password-protected access to the camera’s and NVR’s video and network setup. The flexible storage options of the Performance Series IP Embedded NVR plus the fully-featured IP IR cameras make this kit perfect for many security applications. Recording a video clip of the event to the client’s PC or network-attached storage. Enabling a visual or auditory notification (a flashing light, bell or siren).